While last week was a fun take on all things love and Valentine's Day, this week I am sharing a little insider scoop from my marriage and a few things that my husband does not-so-love (aka is "still learning to like") himself! I’m going to be really honest here. My husband is a born and raised Texan. With that, it is safe to share that vegetarian meals are the one thing I offer that he is usually less than excited about. He is super supportive of all the healthy new recipes I attempt (even when I know they aren't what he would pick on his own). But I admit, I have yet to find many completely vegetarian (let alone vegan!) meals that he would gladly eat again. Maybe it is my cooking or that I just haven't found a real winner yet, but that’s what I am working with. Do you have a similar struggle in your home? As much as I try to emphasize at least half our plates as veggies at each meal and lessening the amount of meat we eat (even if a meal isn’t entirely meatless), I know that realistically, vegetarian meals in our house are a tough go on a weekly basis. It seems many of us are divided in either being vegetarian or vegan, wanting a more plant-based lifestyle, or our families being, let’s say, less than on board with the idea of even a "Meatless Monday." Since I addressed my husband's lack of zeal towards vegetarian dishes, or moreso, meat alternatives above, I thought I would include the following question for this week's subscriber-submitted question! SUBSCRIBER SUBMITTED QUESTION: "I’m always confused how much meat I should give to my toddler (once a day or a few times a week) considering that she doesn’t always eat tofu/tempeh/beans I prepare. She’s also going to nut-free school so nuts are out most of the time." DIETITIAN MOM TIP: Protein is hands down one of the nutritional concerns I get asked the most about. I could talk on how much kids need, how to ensure they're getting enough, as well as how to also recognize that they may be getting TOO much! Majority of moms I know are fearful their kids aren't getting enough. I am here to tell you that even with a child who refuses all forms of meat, the chances are they are likely still eating enough. If you want to know how much YOUR child needs to gauge if/whether they're eating enough, I encourage you to check out my post: How much protein does my toddler need? This post walks you through how to calculate your toddler's protein needs, as well as what an actual serving is and how much is "enough" each day. So whether you are a vegetarian, vegan, flexitarian, or meat and potatoes family, this is a great resource to give you both peace of mind over how much protein is "enough," while also providing the education on other important nutrients to emphasize with this age. 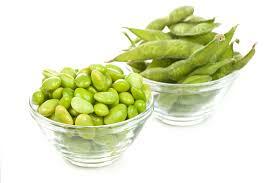 Edamame: Do you ever think to buy it? It is such an easy addition to any meal, but I use it particularly often as a love it food on Asian night. When served in the pods, it keeps my girls so entertained and has been a welcomed “love it food” for them. Knowing they love this, it also helps us when we go out to eat at Asian restaurants to find them an item on the regular (non-kids) menu. 1. Do your kids tend to prefer it in the pods or out of them? Incorporate the edamame both ways and keep a frozen bag of each on hand for a healthy addition to Asian night. 2. Opt for organic. I try not to overly push organic for everything I buy, as I don't think it is necessary nor financially the best option to always invest in. For soy products, most on the market in the U.S. are from genetically modified (GMO) soybeans. Since GMOs are not labeled in North America, the only way to ensure you don't get GMO soybeans (edamame) is to buy organic (which doesn't allow GMOs). Prep the marinade in advance. Store it in a mason jar until the night I plan to use it, then add to salmon while the grill (or oven!) preheats. 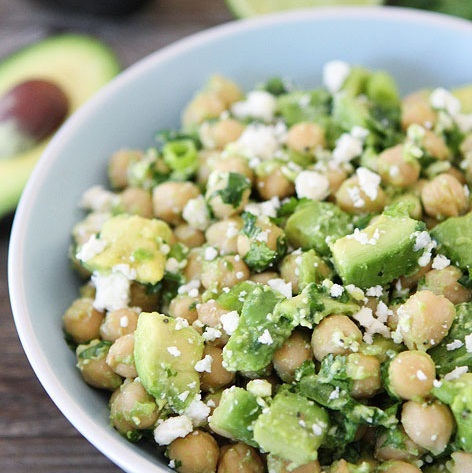 Make a big batch of this so I have plenty to enjoy over the week. If I need a quick dinner, this is an easy one to add a rotisserie chicken and steamed veggies too for dinner in under 10 minutes. If nothing else, cook and shred the chicken in advance for food prep. Ideally, go ahead and cut up the other veggies for this and shred the cheese (since I buy it in a large block), so it is ready at meal times. Make the marinade in advance and store in a mason jar until the night I need it. If I am short on time, buy astir-fry pre-cut veggie medley at Costco, Trader Joe's, or the grocery store. Use this in place of the veggies listed, aiming to include similar ones of a combination of already washed and cut pre-packaged broccoli florets, sugar snap peas, and carrot chips. Cook beef in advance (ideally not more than 3 days prior to the soup, so that the leftover soup stays good for longer). Refrigerate until the day I plan to make the soup. If you aren't getting my COMPLETE meal plans to your inbox each Friday, why aren't you? I send a weekly meal plan with the COMPLETE rundown for how our family serves the entire meal, including my kid's "Love it, Like it, and Learning it" foods for every night shown above. This removes the guesswork with what (or how!) to serve with each of the weekly menu items and puts some concrete ideas and examples in your inbox - effortlessly to you! So sign up here! It's still FREE to all subscribers.